(a) the vowels E & O, which are both short and long (epsilon in the Table) and long (aytay in the Table in alphabetical Greek & o micron (short) & o mega (long) (See the 2 variants on each of these vowels in Greek in Table 2 above) can only be represented by 1 single vowel syllabogram for the same vowels, i.e. E & O, in Linear B. (See also the same Table). (b) the situation seems considerably more complicated with the alphabetical Greek consonants, but the appearance of complexity is just that, merely apparent. 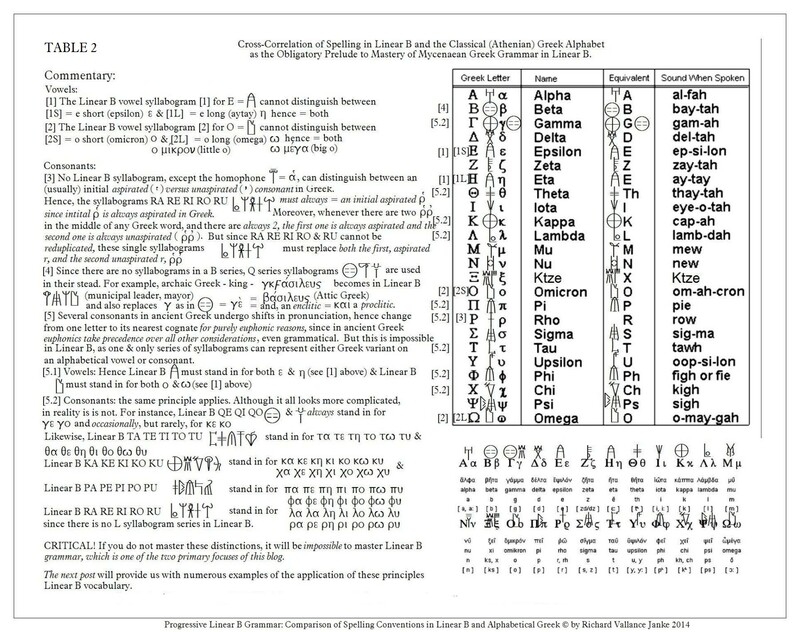 By studying the Table above (Table 2), it should dawn on you soon enough that the Linear B syllabograms in the KA, PA, RA, QE & TA series are forced to represent both alphabetical Greek variants on the vowels each of them contains, since once again, Linear B is unable to distinguish between a short vowel and a long vowel following the initial consonant in each one of these series. (c) In the next post, we will provide ample illustrations of these principles of spelling conventions in Linear cross-correlated with their equivalent spelling conventions in (early) alphabetical Greek. in which only the last two systems, the syllabaries, represented by Linear A, Linear B & Linear C, and the Greek alphabet, contain all of the vowels. This is of the greatest significance in the understanding of the geometric economy of both syllabaries and alphabets, explaining why syllabaries consist of far fewer characters (generally no more than about 80-90 syllabograms, not counting logogams and ideograms, which are merely remnants of the previous systems) than any previous stage(s)in the evolution of ancient writing systems, and why alphabets consist of even fewer characters (only 24 in the classical Attic Ancient alphabet, and never more than 30 in the earliest Greek alphabets). I am reblogging the comparison between Cypriot (Linear C) and Linear B preparative to my thorough analysis of Sir Arthur Evan’s meticulous observations on the parallels between these 2 syllabaries, which lead him to correctly decipher 6 Linear B syllabograms. Stay POSTED. 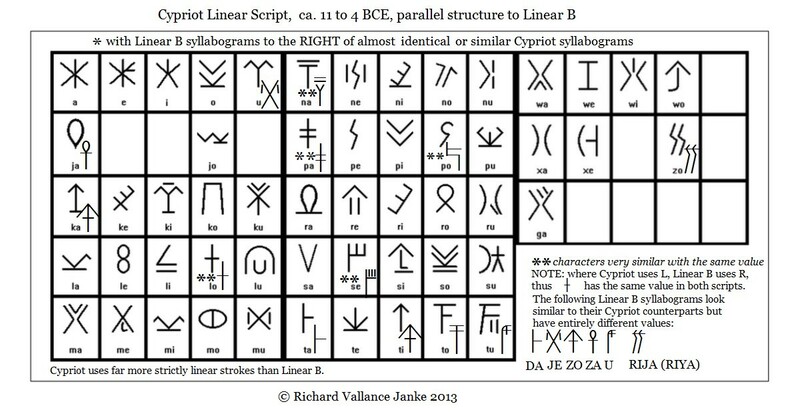 While both Linear b and Cypriot are linear syllabaries, we would be jumping to conclusions to assume that Cypriot was derived from Linear B. However, the striking similarity between some of the syllabograms, even when they convey entirely different vowel or consonant + vowel meanings, is fascinating, especially considering that the Cypriot script did not come into its own until AFTER Linear B had lapsed into disuse. 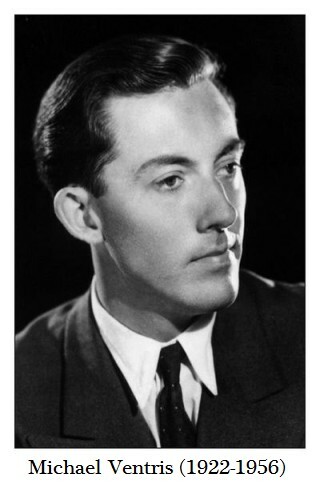 I would like to make a further observation. Many linguists frequently claim that there was a lapse of at least 3 centuries between the disappearance of Linear B (ca. 1200 BCE) and the advent of the Greek alphabet (ca 900 BCE or later) when written Greek completely disappeared, but clearly this is not the case. Greek was continuously written in Linear Cypriot from around 1100 BCE (immediately after the demise of Linear B), all the way through to the 4th. century BCE (! ), when it was at last replaced by the Greek alphabet. In other words, the Cypriots hung onto Linear Cypriot EVEN when the Attic alphabet had reached its perfection. It would appear that the conquests of Alexander the Great finally sounded the death knell of Linear Cypriot.